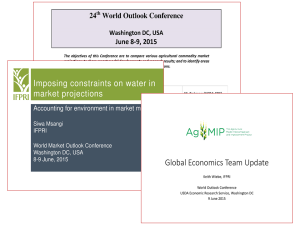 IFPRI’s IMPACT team attends the 24th World Outlook Conference, June 8-9, 2015, Washington D.C.
Every year the GFSF team reconnects with colleagues from a variety of global institutions working in the quantitative foresight modelling arena at the World Outlook Conference. The (24th annual!) meeting this year was held in Washington DC at the offices of the Economic Research Service of the USDA in early June. Please see here for the conference agenda. Attendees included representatives from United States Department of Agriculture (USDA) - Economic Research Service (ERS) and World Agricultural Outlook Board (WOAB); European Commission (EC) - Directorate-General for Agriculture and Rural Development (DG-AGRI) and Institute for Prospective Technological Studies (IPTS); Organization for Economic Co-operation and Development (OECD) - Trade and Agriculture Directorate (TAD); United Nations Food and Agricultural Organization (FAO) - Trade and Markets Division (EST); Agriculture and Agri-Food Canada; Food Agricultural Policy Research Institute (FAPRI); Agricultural Information Institute of Chinese Academy of Agricultural Sciences (CAAS-AII); Japan International Research Center for Agricultural Sciences (JIRCAS); and International Institute for Applied Systems Analysis (IIASA), among several others. The objectives of this conference are to compare various agricultural commodity market projections; to share recent model developments and research results; and to identify areas of possible future collaboration among participating organizations. The focus tends to be on the 10-year outlooks from the partial equilibrium agriculture sector models of the OECD, FAO, EC, and USDA. There is a strong methodological overlap with longer-term projections (eg, from IFPRI, IIASA, and JIRCAS), however, and there are many ways the longer-term approach can inform the shorter-term modelling and vice versa. Lessons from working with the water components of the IMPACT model contributed to the conference in Session 6: Accounting for structural change and environment in market models. Siwa Msangi presented "Constraints on water in market projections." Keith Wiebe brought the group up-to-date on the recent activities and work plans for the Global Economics Team of the Agricultural Model Intercomparison and Improvement Project (AgMIP) in Session 7: Other challenges for modelling markets and policies with a presentation on "AGMIP: latest developments."